LONDON, England (CNN) -- The humble sail is undergoing a revolution and is set to be thrust into outer-space for use on satellites, rockets and other spacecraft. 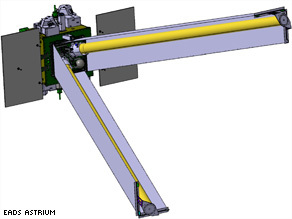 A design drawing shows the 'sails' that will be used to help return spacecraft to Earth more quickly. A new form of sail, known as an "aerobraking sail," is being adapted by space engineers who hope to use it to speed up the return of various forms of space craft to Earth faster than they would naturally fall from the sky. The development comes at a critical time when the volume of space junk in orbit is continuing to rise and poses an ever-increasing collision threat to new missions. Brice Santerre and Max Cerf of European aerospace firm EADS Astrium are the researchers behind the Innovative Deorbiting Aerobrake System (IDEAS) concept, which was presented to the Fifth European Conference on Space Debris in Darmstadt, Germany, last month. Santerre told CNN the aerobraking sail is almost the complete opposite concept to that of a conventional sail used on boats, as it will create drag to slow the craft rather than using wind pressure to propel it. "It's not the same, it's only for drag ... actually it's much more simple. We can't use it for propulsion," he said. In order to achieve a rapid return, Santerre and Cerf have designed what they call "gossamer structures," which are lightweight sails constructed of very thin membranes, that deploy when the object is no longer in use and create drag. "If we sufficiently increase the drag without increasing the mass we can speed up the fall-out using the drive of the atmosphere." Put simply; by creating drag and slowing down the craft's movement, it will help to pull it towards Earth's atmosphere to burn up much more quickly. The reason the sail slows the craft instead of propelling it is because the air pressure in space is too low to create forward momentum. Santerre said he hoped the sail would be a cost-effective way of returning space craft to Earth within a 25 year time-period, whereas it would usually take 70 years without the assistance. This is important as the growing danger of collision posed by space junk has led space agencies to set aerospace firms a guideline of removing craft from orbit within 25 years of their launch date, he said. "There is a problem with debris population, especially in the lower orbit region. There are rules under construction to limit the debris. The (European) Space Agency more and more wants to apply these rules," Santerre said. The other option available for getting rockets stages back to Earth is by using a powered dive towards Earth, however, this can be expensive due to the costs of a reignition. Though still in its design and testing stage, it is planned that the aerobraking sail will be used on a French space project called "Microscope" that is scheduled for launch in 2013. Santerre said there was also hope the new technology could one day be applied to existing pieces of space junk to help remove them from orbit more swiftly. For now, Santerre said his company is seeking potential customers for the new aerobraking sail and they plan to continue improving the concept through research and by testing the deployment and rigidization of their materials in vacuum chambers.